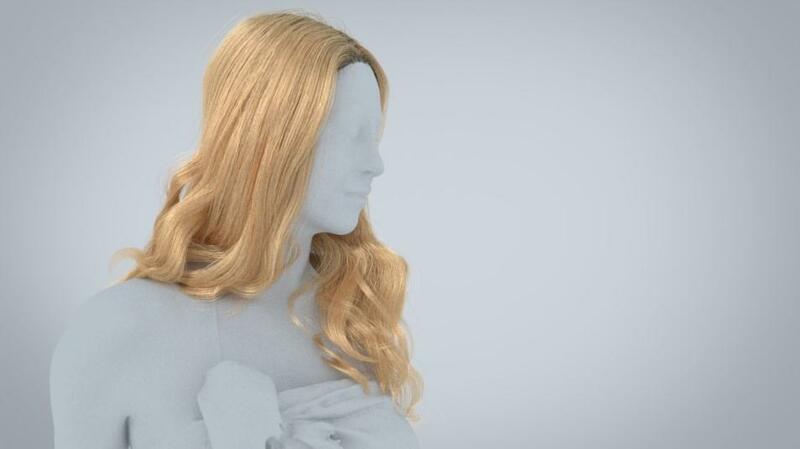 The artist responsible for the insanely realistic digital hair of Human Alloy’s Premium models is Kevin Beckers. 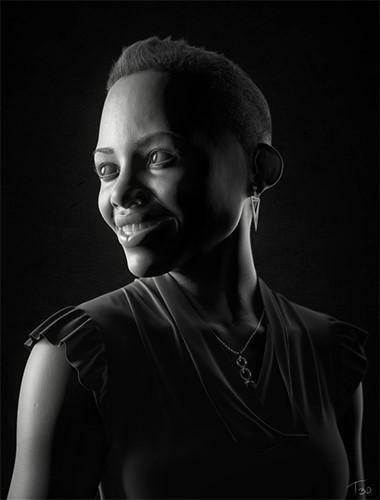 We’ve asked him to share some of his incredible skills in an article on how he creates the digital hair for our 3D people. 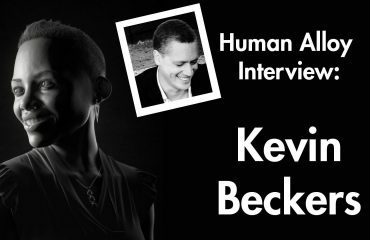 If you’re interested in reading more about ‘our’ Kevin and want to see some of his personal work, check out this interview with him. 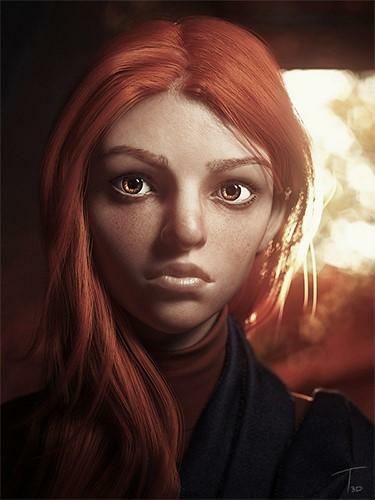 One of the things that really frustrated us when creating realistic illustrations, before we started Human Alloy, was the extreme poor quality of the hair on the models available at that time. 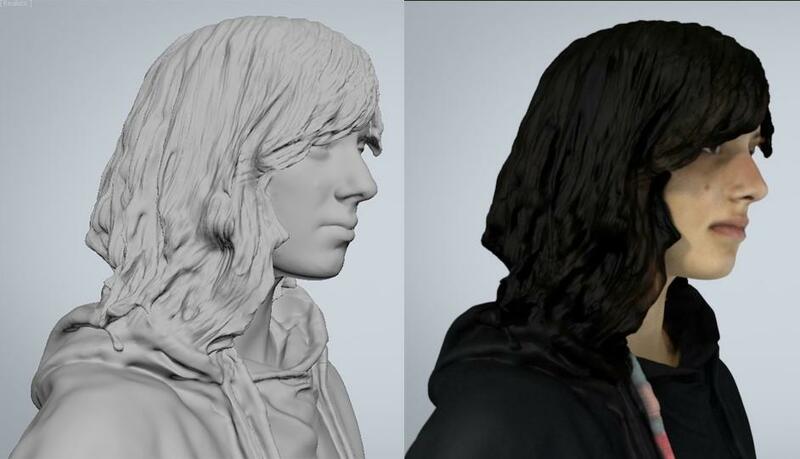 These models have hair that is part of the mesh and it actually just looks like a glob of hair-colored skin instead of nice real fluffy hair. 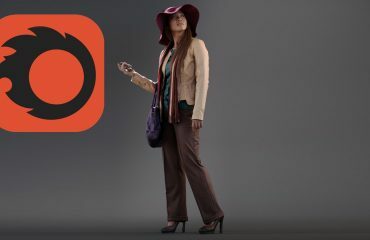 Using these 3D people models always breaks the illusion of the image when they come too close to the camera. It turned out that this frustration was widely shared by different prominent architectural 3D artists we spoke to – like Bertrand Benoit, Johannes Linqdvist and Peter Guthrie. They all had ‘realistic hair’ really high on their wish list. 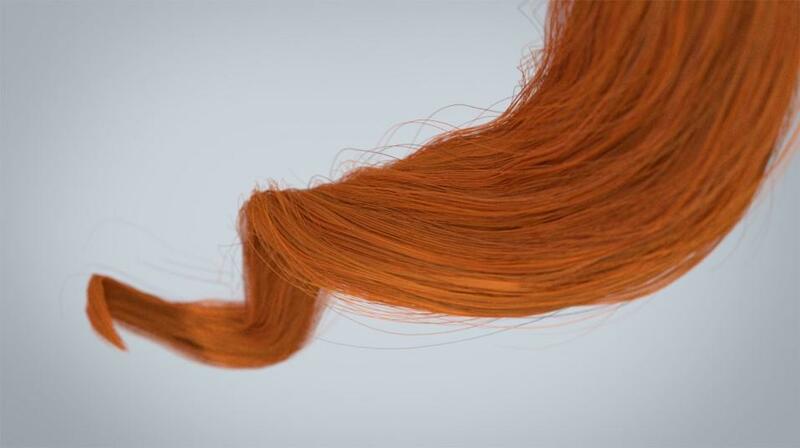 That’s when we knew how we could make a difference with Human Alloy: we needed to figure out how to create realistic digital hair, on a tight deadline. Her hair turned out pretty OK. 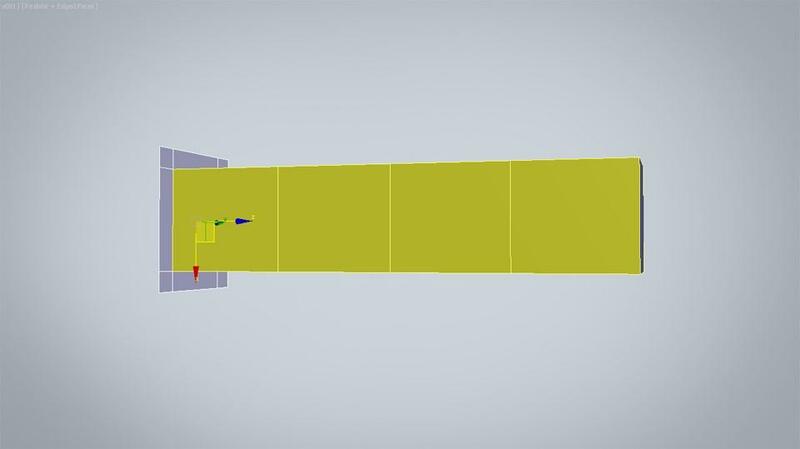 Though making it was a very destructive process, meaning that once you’d made an adjustment, it was really hard to undo these adjustments later on. The tool for me was quite inflexible, and hard to control in a lot of ways. Not something I would like to use a lot anyway. At Human Alloy Tristan and I started researching what would be the best way to do this, going through several different software packages. 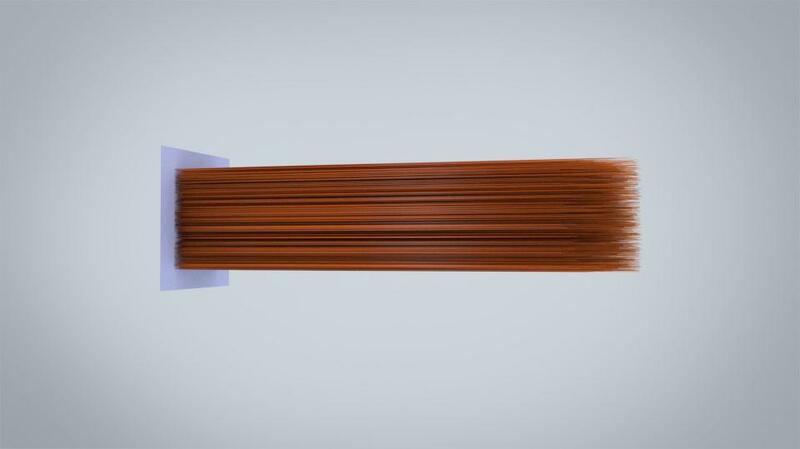 After a lot of testing we finally found HairFarm that gave good results within a tight deadline. 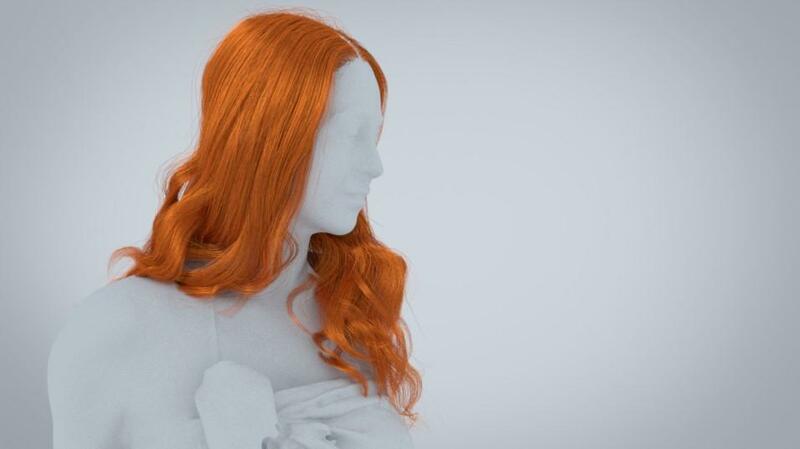 Speed was really important for us, because we knew that creating hair can be a sinkhole of time. 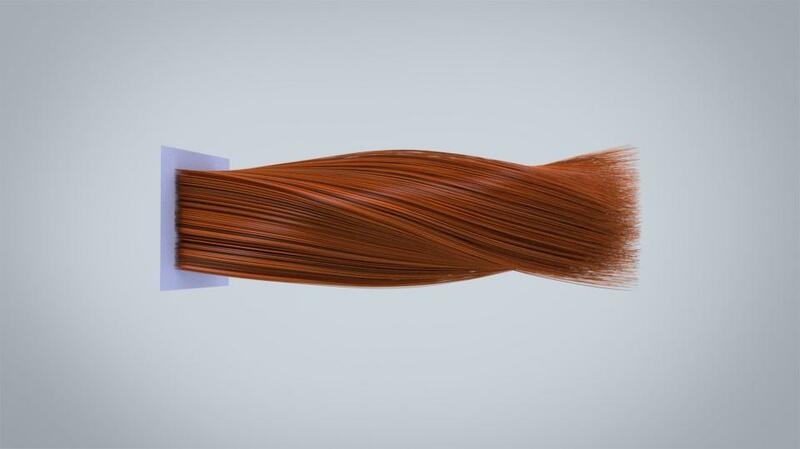 With this tool I made my second attempt on creating digital hair with Autumn. There I went with long hair. I didn’t have much experience and it turned out alright, but the one thing it taught me was that this was the tool for the job. By using HairFarm I really learned about the foundations of hair and I better understood how tools like XGen and Ornatrix worked. 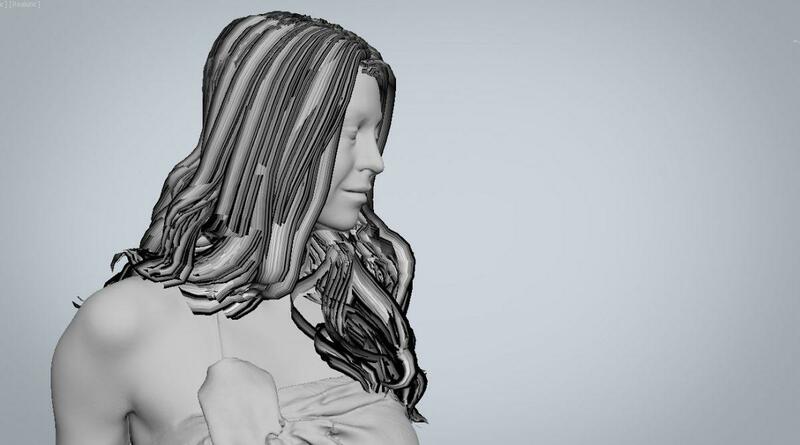 That’s probably also the main reason why digital hair modelling is such a niche: it really is a lot of work to get right! It requires a lot of technical knowledge on the software you’re using. Apart from that I think it’s also not as high a priority for people to learn, compared to hard surface modelling (cars, robots & products) or organic modelling and sculpting (humans, creatures & organic shapes). Usually people want to master that first, and those skills are actually also more fun to learn..! I mean, to be fair, hair only becomes interesting when you get really good at those skills, because having lovely hair on a terrible head seems … weird! But let’s get back to the process of creating digital hair. 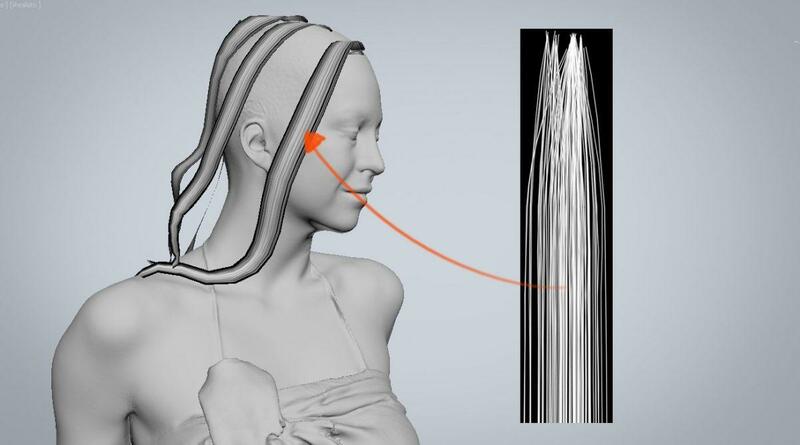 HairFarm is very similar to poly modeling, which is one of the most common modeling systems used in 3D and is something that any 3D artist is familiar with. Unlike more traditional hair creation tools – which have a steep learning curve and take quite a bit of time – HairFarm is pretty easy to pick up and quick to get decent results. Before I start creating the hair, I gather up references of the hairstyles we need from the photoshoot we do to create our 3D people models. I then begin by analyzing the hair structure and decide what the key elements are that make up the hairstyle. In the picture you can see the woman has big glamorous curly locks, so that’s what I will be looking to create. Reference is always important in 3D, you may think you know what something looks like by memory, but how often have you actually looked at what a haircut looks like? The little hairs in the neck, how it drapes over the skulls, how the lock of hair at the front of the head transitions all the way back over the shoulder. It’s impossible to make up all these little details, and exactly these details are what makes it look real! Therefore having a bunch of pictures to look at is truly a must. Once I’m satisfied and I have enough understanding about the structure, the flow and the different sections of the hair, I start laying it out in strands. This is a time consuming but very Zen process. You have to lay down every thick lock of hair by hand. The only thing the computer really does, is duplicate your handcrafted single strand, by 100’s. So if you see a single lock of hair fall over her shoulder in a particular way, that shape was very often created by hand. Now imagine there are 30 of those locks, and they all have to look natural. Laying down the main shapes is therefore definitely the most time consuming, but it’s all worth it because the result is so much more realistic. Once that’s done, I convert it all into thousands of individual hair strands, and tweak the strands to look controlled yet random. I add little fly-away hairs for instance. 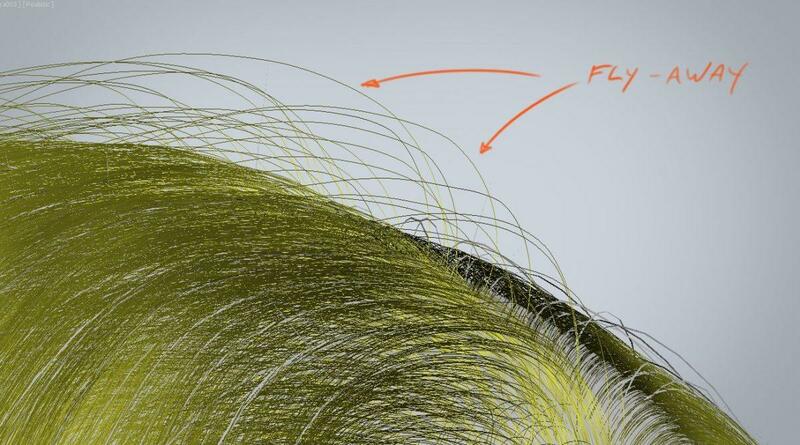 These are singular strands that break up the profile of the hair, making it all look more fluffy. Then the final step is matching the color and in this case for instance adding some of that gradient transition on the top of her head. For this step it’s also crucial to have good reference so I can really analyze the color and gradation of the actual hair. Once the hairdo is approved internally, it is collapsed. 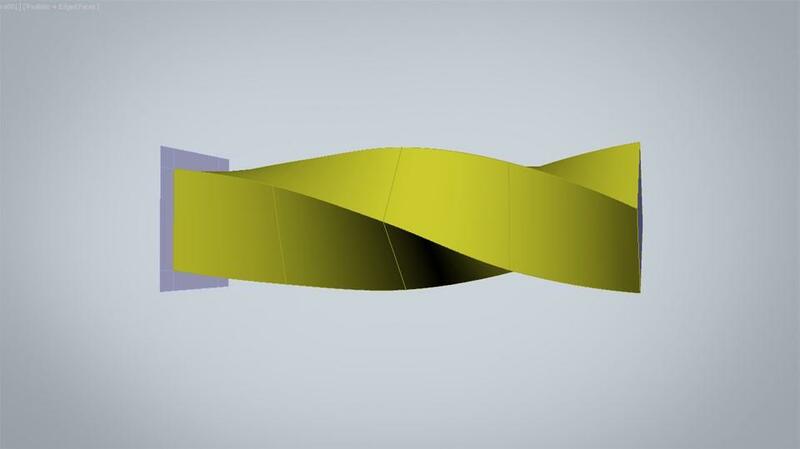 This means all the little strands of hair are converted into a geometry mesh that is entirely free of the tool we used to create it and can be opened by all 3d software packages. 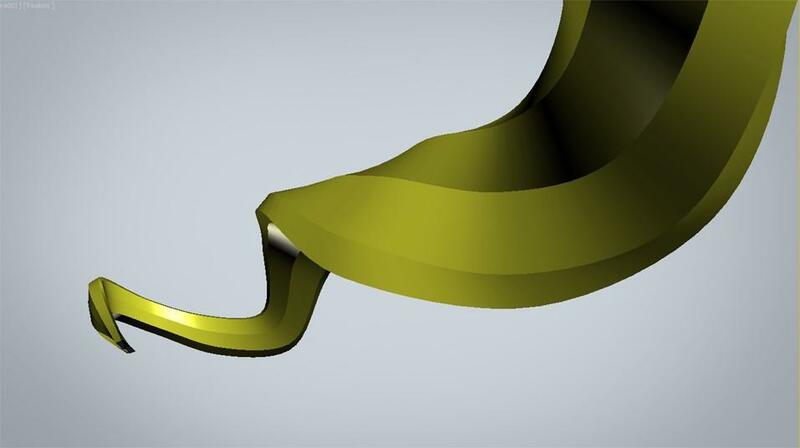 The downside of this step is that the digital hair is no longer adjustable. So apart from maybe changing the color, there is not much that can be changed on it from here on out. 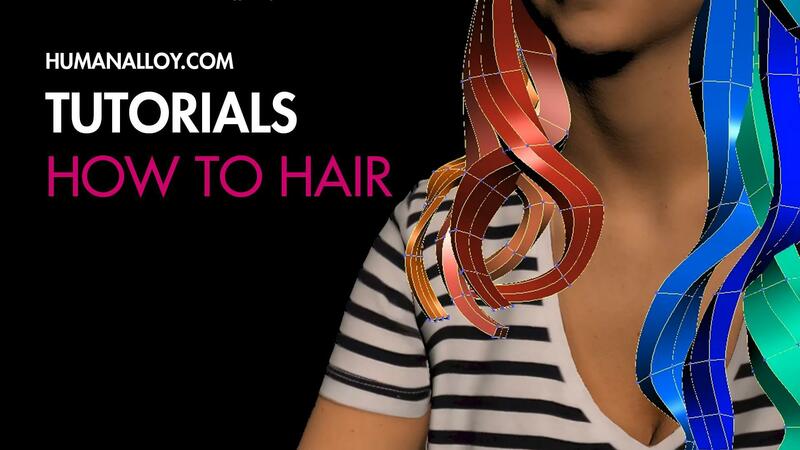 The final step is to create a low poly version of the hair. In the first year of Human Alloy we didn’t do this, but we got quite some requests for hair that was less resource intensive. 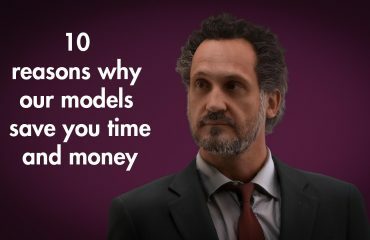 Especially when our models are used in the background or with a bunch of them together, it used to become quite heavy for the computer and therefore hard to use. So nowadays we make a simplified version of the hair. We reduce the heavy haircut to a fraction of itself by making the resulting strands flat and wide so we can then stick an image of a group of hairs on it. 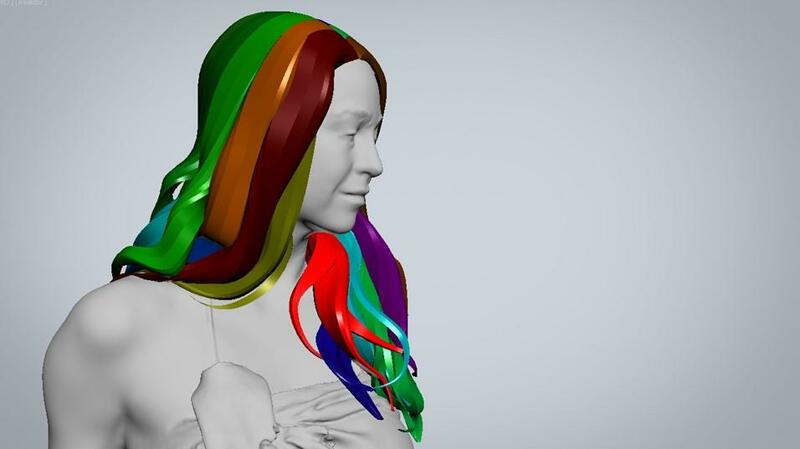 This is a lot less intense for the computer to deal with, but gives a good result for medium to far ranges, very similar to how video game hair is made. The result is a nice fluffy looking low intensity version of the high quality hairdo, perfect for resource intensive scenes like large office spaces or outside scenes. 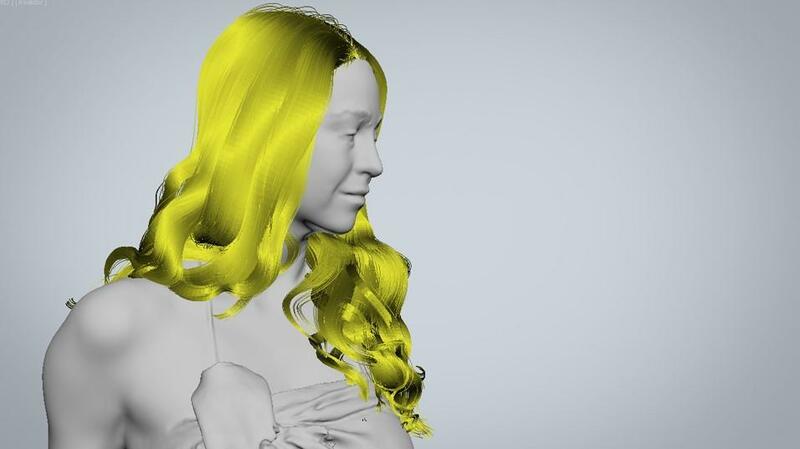 With this solution for hair, we try to make our models a perfect fit for all types of environments, ranges and uses.